Once your domain has been verified, you can set up user mail accounts by clicking 'Add users' or 'Import users' from the Control Panel. You can choose to add users one at a time by email address or use the bulk upload feature to import up to 200 users at a time with a .csv file. Advanced users and large organizations can get in touch at support@zohomail.com for help with the 'Active Directory Import wizard' in order to create a user base from their active directory. Once your domain has been verified using either the CNAME/ TXT or HTML methods, the email hosting for the domain will be enabled automatically. You can enable or disable email hosting for a domain by clicking the Mail icon for that domain in the domains page. If mail hosting for a domain is enabled, an account will only be created for the user when you add them. If mail hosting is disabled, the user will be created without a domain-based mail account. When you disable a domain's email hosting, all aliases based on that domain will be deleted. Log in to Control Panel (https://mailadmin.zoho.com/) as an Admin or Super Admin. Click Control Panel, then select User Details. If you are using a paid account, you will be have two options. If not, you will be directed to manually add the users. Select the Create User option from the two options given. Enter the user's first name, last name and email address in the appropriate text box, then select a domain from the drop-down menu. The email address will get auto-filled based on your preferences set in the Preferred Email Format. You can also edit it in the Email ID field. Provide a password for the user. It is mandatory that the password has a minimum of 8 characters, with one numeric character and one special character. Make sure the user receives this password, as they will need it to log in to their account. 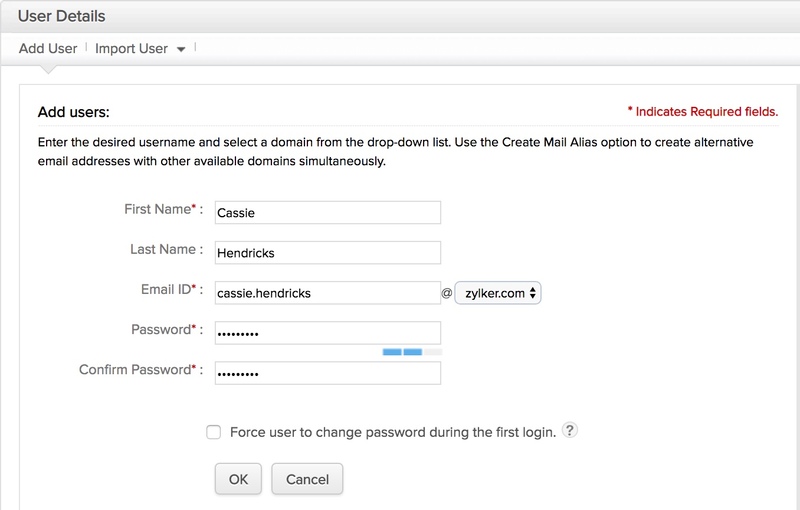 Click Create Email aliases for other domains option, if you want to create aliases for this user in the domains configured with your organization account. 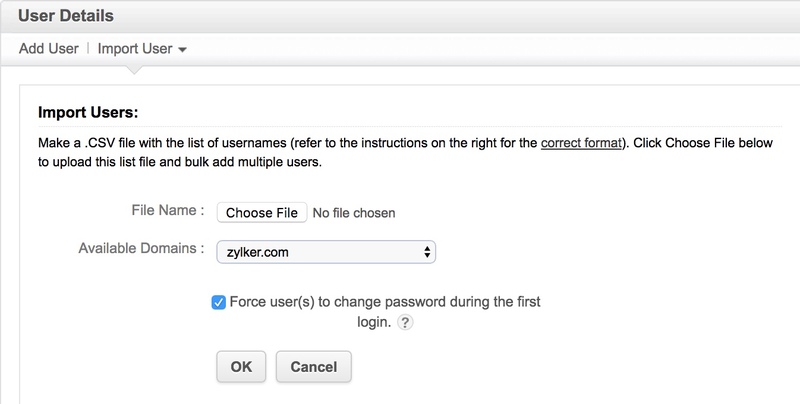 Select the domains for which you want to create aliases from the popup, and click Ok.
Click on the 'Force user to change password during the first login' checkbox if you want the password you have set to be changed by the user on first logging in. Click Ok, and the user will be created. You will not be able to use email addresses such as abuse@domainname.com and postmaster@domainname.com as individual accounts or aliases for individual accounts. These email addresses will be used to report spam incidents. However, you can create Groups named abuse and postmaster and add yourselves as members of the Group. Learn more. You can invite users to join your organization account by typing in an email address here. An invitation will be sent to this address and upon accepting the invite, the user will be added to your organization account. You can also invite users whose email addresses are with an email provider other than Zoho. If a user already has a business account with Zoho, they won't be able to join your organization. In this case, the user will need to remove their existing organization from their account. In the Zoho Mail Control Panel, go to the User Details option. Select Add User, and then pick the Invite User option. Enter the email address of the user that you would like to invite. Please note that an invitation to join will be sent to the mentioned email address. Once a user becomes a part of your organization, any data in their email account will be treated as organization data. If a user account is removed or deleted from your organization, any data associated with that account will be deleted permanently and cannot be recovered. Inviting users will avoid the loss of data if the user already has any other Zoho applications like CRM, Recruit etc linked to their account. When you create a user, they will be able to login to their account and send emails immediately. However, they will not receive any emails until the domain's MX entries are pointed to the Zoho Mail servers. The domain's MX Records can be cross-verified at www.mxtoolbox.com, a third-party tool that is used to check the domain's DNS records. The option to Invite Users with their email address will only be available to organizations that are using the paid plans. To set up users in Zoho Mail by importing from a .csv file. Login to Control Panel (https://mailadmin.zoho.com/) as an Admin/ Super Admin. Select the Import from CSV option. Download the sample CSV file from the right side pane. In the sample CSV file, enter the users' first name and last name in their respective columns, 'username' in the Name column and the 'Password' in the appropriate column. The other columns are optional, and you may provide the values based on your requirements. Once you have entered all the appropriate data, save the file in .csv format. Click Choose File, to select the file that you choose to import. Select the primary domain, for which the accounts will be created. Click on the 'Force user(s) to change password during the first login' checkbox if you want the password you have set to be changed by the user(s) on first logging in. If you have multiple domains and wish to have domain-based aliases, click More, to view and select the additional domains in your organization. You can invite multiple users to create an account with Zoho Mail by importing a .txt file. This file should contain the email addresses of those users you are inviting to the organization. Enter the email addresses separated by commas. For example, if you want to invite two users, paula@zoho.com and justinc@zoho.com, enter these values in the file like this: paula@zoho.com, justinc@zoho.com. Click Choose File in the invite user option under CSV file, and select this text file, and then click Ok. If your Organization has a CRM account or if you are a Zoho CRM Administrator and want to set up mail hosting for the entire domain, you can directly associate the users you already have in Zoho CRM with Zoho Mail Suite, using the 'Import from CRM' option. The Super Admin in CRM must also be either an Admin or Super Admin in Zoho Mail to utilize this option. 'Invite from CRM' option will only work when a CRM Admin logs into Zoho Mail and uses the Import from CRM option. Log in to Control Panel (https://mailadmin.zoho.com/) as a CRM Super Admin. Open the Control Panel and click User Details. Click Import Users from CRM. The users in your CRM Organization (with matching domain-based email addresses) will be added directly to the Zoho Mail Suite. Any other users in your organization can be added using the CSV file or Add user option. CRM users with email addresses from the same domain can only be imported directly to Zoho Mail. Users with a different domain-based address must be invited to the organization. If a CRM user who needs to be imported has already set up another organization, an error will occur. The user must log in to their account, and delete that organization in order to join yours. Only then the user can join this organization. Detailed instructions to delete an organization can be found on this help page. Those users should not close their account as it might lead to data loss. If your organization avails other Zoho services, users who have been added there can directly be imported into Zoho Mail. Follow these steps to import users from other Zoho services into Zoho Mail. Log in to the Zoho Mail Control Panel. Choose the Import User option, and select From Other Services in the drop-down list. Users who have accounts in other Zoho services, but don't have an account in Zoho Mail will be listed. Locate the users whom you want to import to Zoho Mail, and click the Import to Mail option across the respective user. Enter the email address you want to create for this account, and select the domain name from the dropdown list (in case there are multiple domains). Click Import this user to Mail. The selected user will be added to your Zoho Mail organization account. Zoho Mail provides tools to discover and create corresponding users and email accounts in Zoho Mail, automatically. Install the Zoho Mail Active Directory User Provisioning Wizard in your system. When you execute the Wizard, you will be requested to provide the Super Admin credentials. You need to provide the Server in which the Active Directory is installed. You should have the details of the LDAP query to be used to list the users of the organization. You need to map the attributes of the Active Directory with the fields provided for Zoho Mail users. Based on the LDAP query and the attribute selection, the results will be displayed. After validating the results with your organization's user details, click 'Finish' to provision the users in Zoho Mail. You can request the LDAP tool for User Provisioning, by sending an email to support@zohomail.com with your organization details. Once you have created the user accounts, send them their login information and have them test their accounts to make sure they're set up properly. From your web browser, go to www.zoho.com/mail. Provide your password and click log in. Now you can access your account and emails. You can send emails right away, but to receive them your account must be configured for email delivery. You can view a list of all the users that are created in your organization by logging in to mailadmin.zoho.com and navigating to the User Details section. Alternatively, you can also access the User Details menu using this link. You can search for specific users using the search toolbar on the top right corner of the Groups page. Users can also be filtered by the role assigned to them using the Filters option on the top right corner of the page. Further, you can also view the list of users associated with a particular domain by choosing the relevant domain from the Filters listing. Zoho Mail provides many options in the Group listing page, that makes it easy to perform certain functions on groups. You can add new users, import users, export user details, apply email policies, allocate location and delete users. In case you need to export user details you can make use of the Export User(s) option from the Users listing page. You will be able to find three options in the export menu. If you click the Export User option, all users associated with your organization will get exported as a .csv file. If you have selected certain groups using the checkbox, and click the Export User option, you will find an additional Export selected Users option. This will export only the users that you have selected. If you filtered groups by domain, and then select the Export User option, you will find an additional Export all filtered Users option. This will export all the users created for the selected domain. The exported contacts are saved as .csv file. While exporting, you can choose to encrypt the .csv file with a password for the security of your data. After you click on Export, an Encrypt Password pop-up will appear. Select the Encrypt with Password checkbox in the pop-up to add a password protection to your file. The .csv file will be exported as a Zip file. You need to unzip the exported file in order to access the .csv file. You can apply email policies to Users from the listing. When you click this option, all configured policies will be listed. You can select the required policy, and apply it to the groups on your listing. You can also add a new policy by clicking the Add New option in the listing. You can select users using the respective checkbox, and click the Delete option from the top menu. You can use any of your email addresses to login to your Zoho Mail account. This can be configured from the User Details section. Go to User Details, and select the relevant user. Click the Change Login Email IDs tab. All the email addresses that you have added as aliases to your account will be listed. Select the Edit option across the required email address. In the right pane, the email address you have selected will be shown in the Email ID field. If you want to make this account as your Primary Account, select the Is Primary check box. Enter the Admin Password to make this change and then click Ok.
Alternatively, you can also change your login email address by entering the address in the right pane. Enter the address here, and provide the Admin Password. You will be able to login using this address only after it is confirmed. In case the email address that you entered has not been confirmed, you will be able to make it as a primary only after the email address is confirmed.